Talks between the EU and the US on the Trans-Atlantic Trade and Investment Partnership, or TTIP, have essentially failed, German Vice Chancellor and Economy Minister Sigmar Gabriel has said. “In my opinion the negotiations with the United States have de facto failed, even though nobody is really admitting it,” the minister told ZDF broadcaster, according to a written transcript of the interview to be aired on Sunday. He noted that throughout 14 rounds of talks the two sides have not been able to find common ground on a single chapter of the deal being discussed. Among the stumbling blocks is a US objection to opening public tenders to European companies. “For me, that goes against free trade," Gabriel previously commented regarding the issue. Washington has been insisting that the free trade deal be signed before the end of 2016, but it has encountered strong opposition from a number of European nations, not only Germany. 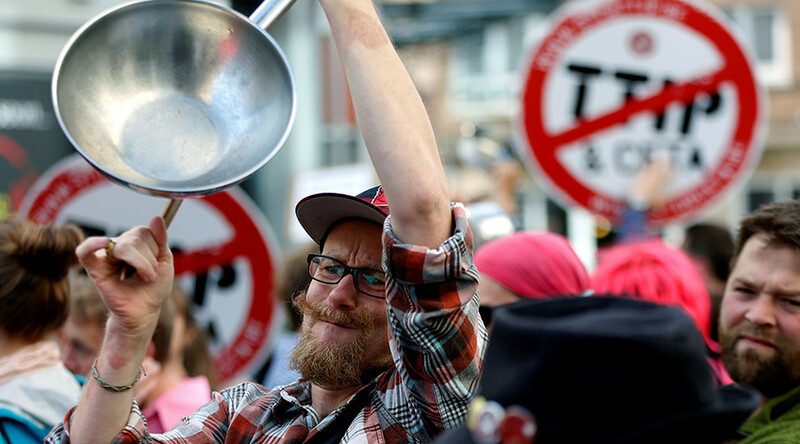 Critics claim that TTIP is dangerous as it could place the interest of international corporations above those of the nations they operate in, and undermine European standards for labor and environmental protections. Gabriel compared TTIP with the Comprehensive Economic and Trade Agreement (CETA), a free-trade treaty that the EU and Canada have been negotiating, which he said was fairer on the parties involved. The European public has also been unhappy with TTIP as the contents of the deal are secret. However, recent leaks suggest that it will affect food safety laws, environmental legislation, banking regulations and open the EU for GM crops. 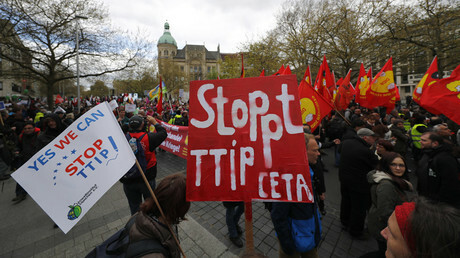 Opponents of the deal have been staging protests in a number of European cities. The most recent one took place in Berlin last weekend, with activists calling for a nationwide demonstration on September 17. An unprecedented public campaign against TTIP is making politicians on both sides of the Atlantic “really worried” about the fate of the trade negotiations and is forcing them to find pretexts to put the agreement on hold, Lode Vanoost, a journalist and former deputy speaker of the Belgian Parliament, told RT. “The protest against this deal is unseen compared to the previous deals. There were already some precedents in the past when big deals like this multilateral investment agreement was blocked by popular protests,” Vanoost said. “They are all looking for a way out to postpone the whole deal,” he added. According to Vanoost, Gabriel’s criticism of the TTIP may be a part of power struggle within the German elite. But he says the agreement itself is a pact between US and European elites and has nothing to do with the interests of common people. “This is something that US always wanted to prevent ever since the end of WWII,” Vanoost said.